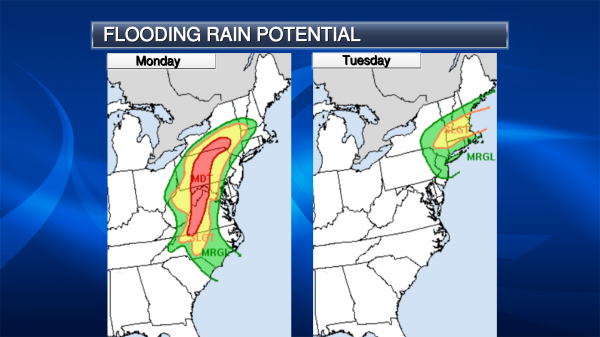 The extreme rain that has fallen due to Florence across parts of the Mid-Atlantic continues to pose issues this morning – and will do so for at least the next week across the region. Dams and levees have been threatened. Residents downstream of the Headwaters Dam were told to evacuate last night as the county emergency manager reported the dams immediate failure. There is no access to Wilmington, NC, as flooding has closed roads and the airport and Port of Wilmington remain closed. At least 450 people have been rescued from floodwaters in Wilmington. Officials are planning on airlifting food and water in. At least 900 people have been rescued across the state of North Carolina in swift-water rescues. Meanwhile, at least 100 rescues were conducted in Marion and Mullins, SC, yesterday. New mandatory evacuations have been ordered in areas across the Carolinas as water continues to rise on rivers. Parts of Fayetteville, NC, have been evacuated as authorities ordered those living within a mile along parts of the Cape Fear River and the Little River to leave. Florence County, SC, issued evacuation orders for those near Black Creek Sunday, and other evacuations occurred in Bennettsville, SC. Sadly, 18 people have died due to impacts from Florence – 12 in North Carolina and 6 in South Carolina. New tropical system rainfall records have likely been set in both North and South Carolina. Rainfall totals have topped 30” in parts of North Carolina since rain began last week. 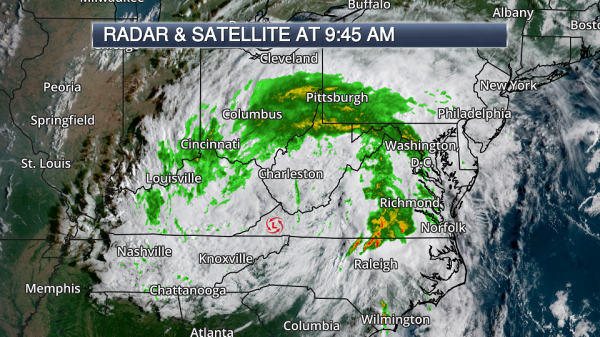 Tropical Depression Florence, sitting near the Virginia/Kentucky/West Virginia border this morning will move in a northeasterly direction today before turning to the east tomorrow, picking up forward speed as it does so. Heavy rain will continue to be the main threat, with the potential of 2-6” along the path of the system over the next couple days. 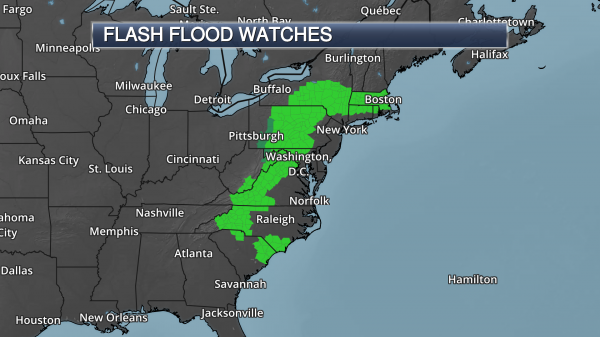 Numerous Flash Flood Watches from the Carolinas into New England are in effect. Florence As Of Monday Morning. As of the 5 AM ET update from the Weather Prediction Center, what is left of Tropical Depression Florence is sitting 125 miles west-southwest of Roanoke, VA, or 145 miles west-northwest of Greensboro, NC, moving to the north-northeast at 13 mph. 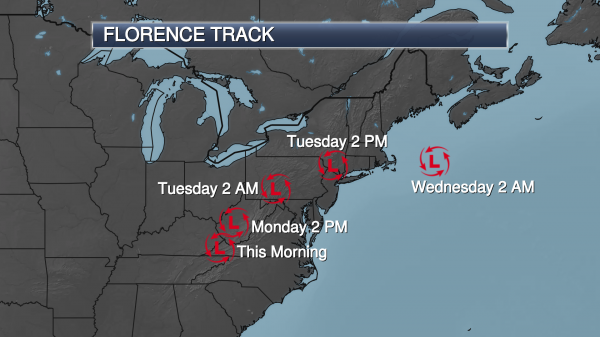 Tropical Depression Florence had sustained winds of 30 mph. Feet Of Rain. 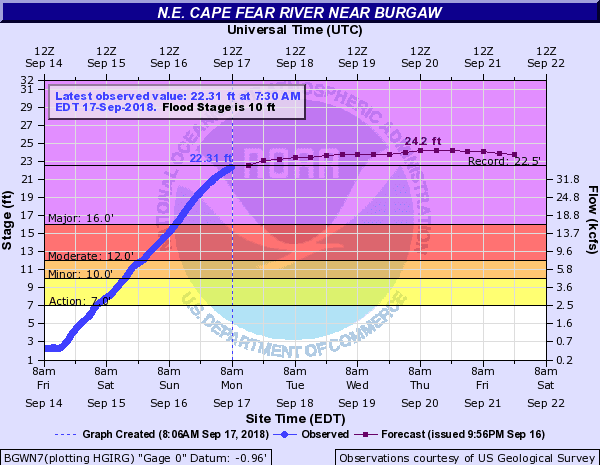 Rain continued to fall across parts of the Mid-Atlantic on Sunday, and some areas of North Carolina have received over two and a half feet of rain since last week in association with Florence. If any of the top five rainfall reports from North Carolina verify, Florence would hold the record for most rainfall from a tropical system for the state. That currently is held by Hurricane Floyd in 1999 which brought 24.06” near Southport. Meanwhile, if the 18.13” report from Marion, SC, verifies, Florence would hold the record for most rainfall from a tropical system in South Carolina currently held by Tropical Storm Beryl in 1994 (17.45” near Jocassee). Ongoing Flood Alerts. 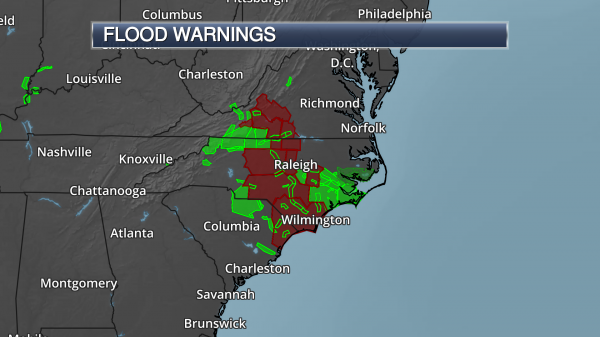 Due to the extreme rain from Florence, numerous Flash Flood and River Flood Warnings continue to be in place across parts of the Carolinas and Virginia this morning. Ongoing River Flooding. 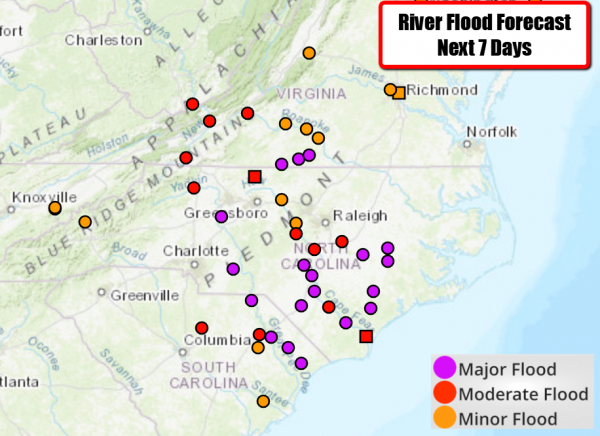 As of Monday morning, 17 rivers across North and South Carolina are in major flood stage with numerous other ones in minor or moderate stage. 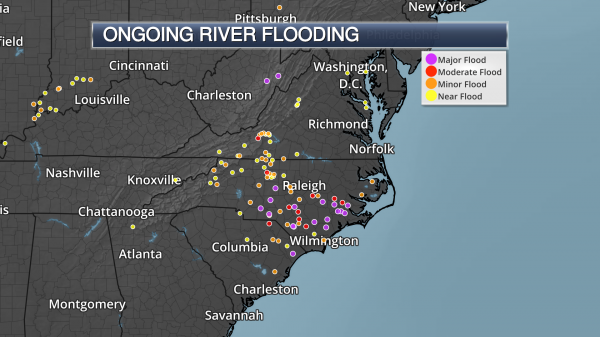 These rivers will continue to be elevated for an extended period of time as all the water from Florence rushes into them. You can view local river data at https://water.weather.gov/ahps/. Trent River At Trenton. 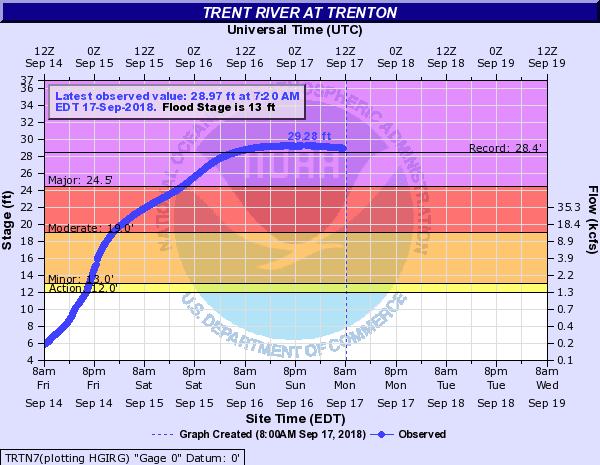 The Trent River at Trenton set a new record crest Sunday, reaching 29.28 feet, which broke the previous record of 28.4 feet set during Hurricane Floyd. The Trent River continues to sit above its previous record this morning. When the river reaches 28 feet, the entire town of Trenton is flooded. Forecast River Flooding. 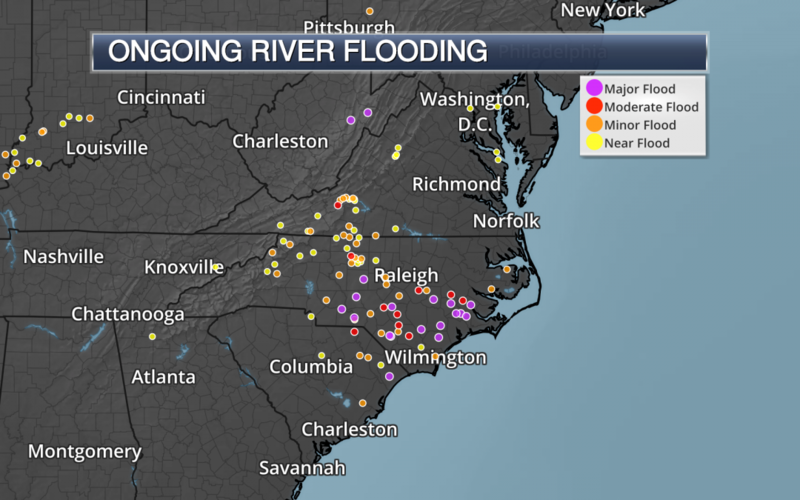 Due to the extreme rainfall across the Carolinas and into parts of Virginia, major to extreme river flooding will continue to be possible over the next several days. Once again, in some areas, this river flooding could rival Hurricane Matthew from 2016 or Hurricane Floyd from 1999. Road Closures. Due to the ongoing flooding across the region, many roads have had to be closed. North Carolina continues to tell residents to stay off the roads unless evacuating and that out-of-state drivers should travel around North Carolina. As of 4:30 PM Sunday, NCDOT said there were almost 700 road closures across the state, which included several sections of I-95 and I-40. They also say that travel should be completely avoided south of US 64 and east of I-73/I-74. 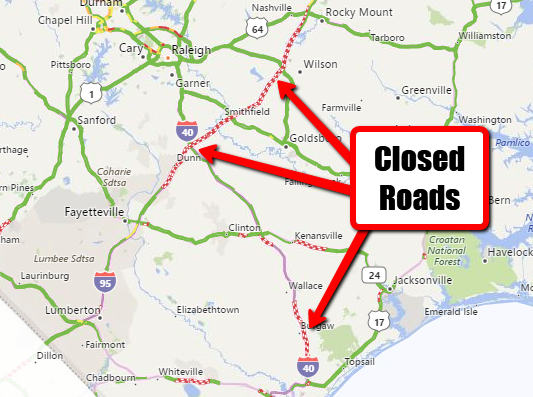 In South Carolina, I-95 between mile markers 181-190 near the North/South Carolina border was also closed due to flooding, and as of 4 PMSunday, there were 125 road closures statewide. Forecast Track. Florence will move in a more northeasterly direction today before turning to the east tomorrow, picking up forward speed as it does so. While the greatest threat from what is left of Florence will be heavy rain, a few tornadoes can’t be ruled out. Rain Forecast. Rainfall amounts of at least 2-4” will be possible over the next couple days along the forecast track of Florence from parts of the Mid-Atlantic into the Northeast. Some isolated 6” amounts will also be possible. Further south across already hard-hit areas from Florence, an additional 1-2” of rain is possible in spots across the Carolinas, only adding to the ongoing flooding issues. Flash Flood Watches. Due to the heavy rain potential, Flash Flood Watches continue along the path of Florence. These stretch back into the Carolinas (for the potential of additional rain on top of what has already been received) northward along the forecast path of this system across the Mid-Atlantic and Northeast. Excessive Rain Outlook. The heaviest of the rain today – rain that could lead to flash flooding at times – will occur over the Virginia Blue Ridge to the crest of the Appalachians through the Catskills. In these areas, rainfall amounts of 1-3” will be common, with up to 5” in localized spots. Due to the heavy rain threat, a Moderate Risk of excessive rainfall leading to flash flooding is in place today across these areas. 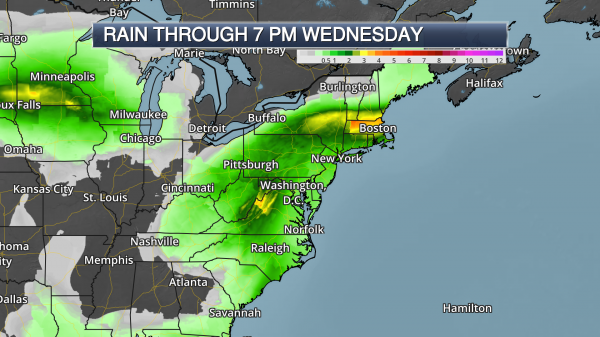 Tomorrow the heaviest rain moves into parts of New England with a Slight excessive rain risk in place.